For other uses of "Astrakhan", see Astrakhan (disambiguation). 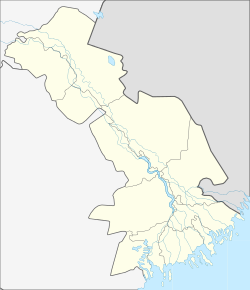 Astrakhan (Russian: Астрахань, IPA: [ˈastrəxənʲ], Tatar: Ästerxan, Hacitarxan, حاجی‌ ترخان) is a city in southern Russia and the administrative center of Astrakhan Oblast. The city lies on two banks of the Volga River, close to where it discharges into the Caspian Sea at an altitude of 28 meters (92 ft) below sea level. As of the 2010 Census, its population was 520,339; up from 504,501 recorded in the 2002 Census and 509,210 recorded in the 1989 Census. The name is a corruption of Hashtarkhan, itself a corruption of Haji Tarkhan(حاجی‌ ترخان)—a name amply evidenced in the medieval writings. Tarkhan is possibly a Turco-Mongolian title standing for "great khan," or "king", while haji or hajji is a title given to one who has made the Islamic requisite of pilgrimage to Mecca. Together, they denoted "the king who has visited Mecca." The city has given its name to the particular pelts from young karakul sheep, and in particular to the hats traditionally made from the pelts. Astrakhan is in the Volga Delta, which is rich in sturgeon and exotic plants. The fertile area formerly contained the capitals of Khazaria and the Golden Horde. Astrakhan was first mentioned by travelers in the early 13th century as Xacitarxan. Tamerlane burnt it to the ground in 1395 during his war with the Golden Horde. From 1459 to 1556, Xacitarxan was the capital of Astrakhan Khanate. The ruins of this medieval settlement were found by archaeologists 12 km upstream from the modern-day city. Starting in A.D. 1324, Ibn Battuta, the famous Muslim traveler, began his pilgrimage from his native city of Tangier, present-day Morocco to Mecca. Along the 75,000 mile trek, that took nearly 29 years, Ibn Battuta came in contact with many new cultures which he writes about in his diaries. One specific country that he passed through on his journey was the Golden Horde ruled by the descendants of Genghis Khan, located on the Volga River in southern Russia; which Battuta refers to as the river Athal. He then claims the Athal is, “one of the greatest rivers in the world.” ( Battuta, 79). In the winter, when the weather is very cold, the Muslim ruler, or Sultan, stays in Astrakhan. Due to this cold water, the King [Sultan Mohammed Öz Beg] orders the people of Astrakhan to lay many bundles of hay down on the frozen river. He does this to allow the people to travel over the ice. When Battuta and the King spoke about Battuta visiting Constantinople, which the King granted him permission to do, the King then gifted Battuta with fifteen hundred dinars, many horses and a dress of honor. In 1556, the khanate was conquered by Ivan the Terrible, who had a new fortress, or kremlin, built on a steep hill overlooking the Volga in 1558. This year is traditionally considered to be the foundation of the modern city. In 1569, during the Russo-Turkish War (1568–1570), Astrakhan was besieged by the Ottoman army, which had to retreat in disarray. A year later, the Ottoman sultan renounced his claims to Astrakhan, thus opening the entire Volga River to Russian traffic. The Ottoman Empire, though militarily defeated, insisted on safe passage for Muslim pilgrims and traders from Central Asia as well as the destruction of the Russian's fort on the Terek river. In the 17th century, the city was developed as a Russian gate to the Orient. Many merchants from Armenia, Safavid Persia, Mughal India and Khiva khanate settled in the town, giving it a cosmopolitan character. Astrahan Kremlin on the definitive postage stamp of Russia. For seventeen months in 1670–1671, Astrakhan was held by Stenka Razin and his Cossacks. Early in the following century, Peter the Great constructed a shipyard here and made Astrakhan the base for his hostilities against Persia, and later in the same century Catherine the Great accorded the city important industrial privileges. The city rebelled against the Tsar once again in 1705, when it was held by the Cossacks under Kondraty Bulavin. A Kalmuck khan laid an abortive siege to the kremlin several years before that. In 1711, it became the seat of a governorate, whose first governors included Artemy Petrovich Volynsky and Vasily Nikitich Tatishchev. Six years later, Astrakhan served as a base for the first Russian venture into Central Asia. It was granted town status in 1717. In 1702, 1718 and 1767, it suffered severely from fires; in 1719 it was plundered by the Safavid Persians; and in 1830, cholera killed much of the populace. Astrakhan's kremlin was built from the 1580s to the 1620s from bricks taken from the site of Sarai Berke. Its two impressive cathedrals were consecrated in 1700 and 1710, respectively. Built by masters from Yaroslavl, they retain many traditional features of Russian church architecture, while their exterior decoration is definitely baroque. In March 1919 after a failed workers' revolt against Bolshevik rule, 3,000 to 5,000 people were executed in less than a week by the Cheka under orders from Sergey Kirov. Some victims had stones tied around their necks and were thrown into the Volga. During Operation Barbarossa, the German invasion of the Soviet Union in 1941, the A-A line running from Astrakhan to Arkhangelsk was to be the eastern limit of German military operation and occupation. The plan was never carried out, as Germany captured neither the two cities nor Moscow. In the autumn of 1942, the region to the west of Astrakhan became one of the easternmost points in the Soviet Union reached by the invading German Wehrmacht, during Case Blue, the offensive which led to the Battle of Stalingrad. Light armored forces of German Army Group A made brief scouting missions as close as 100 km to Astrakhan before withdrawing. In the same period, elements of both the Luftwaffe's KG 4 and KG 100 bomber wings attacked Astrakhan, flying several air raids and bombing the city's oil terminals and harbor installations. In 1943, Astrakhan was made the seat of a Soviet oblast with the RSFSR, which was maintained as a national province of the independent Russian Federation in the 1991 administrative reshuffle after the dismemberment of the Soviet Union. After fraud was alleged in the mayoral election of 2012 and the United Russia candidate was declared the winner, organizers of the 2011–2012 Russian protests supported the defeated candidate, Oleg V. Shein of Just Russia, in a hunger strike. Substantial evidence of fraud was cited by the protesters but an official investigation failed to find significant violations. The activists from Moscow found it difficult to gain traction over the issue with local residents who, like most Russians, accept political corruption as a given that is useless to protest. The emissaries from Moscow persisted, buoyed by celebrities who support the reform movement, drawing 5,000 to a rally on April 14. Astrakhan is the administrative center of the oblast. Within the framework of administrative divisions, it is incorporated as the city of oblast significance of Astrakhan—an administrative unit with the status equal to that of the districts. As a municipal division, the city of oblast significance of Astrakhan is incorporated as Astrakhan Urban Okrug. 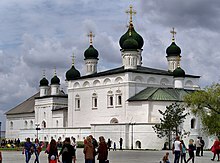 Astrakhan is the archiepiscopal see of one of the metropolitanates and (as Astrakhan and Yenotayevka) eparchies of the Russian Orthodox Church, its only other suffragan being Akhtubinsk. There is also a Catholic community, served by the Church of the Assumption of Mary (Astrakhan). The original Muslim Bulgar population is now gone/assimilated. According to the results of the 2010 Census, the population of Astrakhan was 520,339. Astrakhan features a temperate continental "Uralian" semi-arid climate with cold winters and hot summers. Astrakhan is one of the driest cities in Europe. Rainfall is scarce but relatively evenly distributed throughout the course of the year with, however, more precipitation (58%) in the hot season (six hottest months of the year), which determines the "Uralian" type (as opposed to the "Turkmenon" type, with the wet season during the cold months). It is this even distribution of rainfall and the relatively low annual temperature that causes the city to fall under this climate category as opposed to an arid climate. Winters tend to be cold in the city, though by Russian standards, Astrakhan features relatively balmy winters. Summers in the city can be hot, with high temperatures in excess of +40 °C (104 °F). The mean annual temperature amplitude (difference between the mean monthly temperatures of the hottest and coldest months) is thus equal to 29.2 °C (52.6 °F) (+25.6 °C (78.1 °F) in July and −3.6 °C (25.5 °F) in January), so the climate is truly continental (amplitudes superior or equal to 21 °C (38 °F) determines continental climates, while in semi-continental climates amplitudes vary between 18 °C (32 °F) and 21 °C (38 °F)). Spring and fall are basically transitional seasons between summer and winter. The summers are much hotter than found further west on similar parallels in Europe and worldwide for the 46th parallel. Astrakhan has five institutions of higher education. Most prominent among these are Astrakhan State Technical University and Astrakhan State University. The city is served by Narimanovo Airport named after Soviet Azerbaijani politician Nariman Narimanov. It is managed by OAO Aeroport Astrakhan. After its reconstruction and the building of the international sector, opened in February 2011, Narimanovo Airport is one of the most modern regional airports in Russia. There are direct flights between Astrakhan and Aktau, Istanbul, St. Petersburg and Moscow. Astrakhan is linked by rail to the north (Volgograd and Moscow), the east (Atyrau and Kazakhstan) and the south (Makhachkala and Baku). There are direct trains to Moscow, Volgograd, Saint Petersburg, Baku, Kiev, Brest and other towns. Intercity and international buses are available as well. Public local transport is mainly provided by buses and minibuses called marshrutkas. Until 2005 there were also trams, and until 2017 trolleybuses. Due to shared Caspian borders, Astrakhan recently has been playing a significant role in the relations of both countries. As the Azerbaijani government has been heavily investing into the wellbeing of the city, Astrakhan has recently begun to symbolize the friendship between both countries. In 2010 a bridge was constructed with donations from Azerbaijan, which was named "Bridge of Friendship". Moreover, Azerbaijani government sponsored secondary school number 11, which carries the name of the national leader Heydar Aliyev, as well as a children's entertainment center named "Dream". Apart from that, a park has been built in the center of Astrakhan which is dedicated to friendship between the two countries. In the last 5 years Astrakhan has been visited by top Azerbaijani delegations on several occasions. Ilya Ulyanov, father of Aleksandr Ulyanov and Vladimir Lenin. ^ a b c Энциклопедия Города России. Moscow: Большая Российская Энциклопедия. 2003. p. 28. ISBN 5-7107-7399-9. ^ "В военных подразделениях Астраханской области работают 35 тысяч специалистов — Российская газета — Спецвыпуск № 4762". rg.ru. Retrieved September 6, 2017. ^ Howard Amos (July 17, 2011). "Astrakhan". themoscowtimes.com. Retrieved September 18, 2018. ^ "Gazprom dobycha Astrakhan to be major partner for Days of Spain in Russia within Astrakhan Oblast". www.gazprom.com. April 8, 2011. Retrieved September 18, 2018. ^ "Публикации – Члены ОГМВ Евразия". euroasia-uclg.ru. Retrieved September 6, 2017. ^ "Расстояние между Москвой и Астраханью – Автомобильный портал грузоперевозок". avtodispetcher.ru. Retrieved September 6, 2017. ^ "Lands of the Golden Horde & the Chagatai: 1332 - 1333". University of California, Berkeley (UCB). ^ Janet Martin, Medieval Russia:980-1584, 356. One or more of the preceding sentences incorporates text from a publication now in the public domain: Kropotkin, Peter Alexeivitch (1911). "Astrakhan" . In Chisholm, Hugh (ed.). Encyclopædia Britannica. 2 (11th ed.). Cambridge University Press. p. 795. ^ David M. Herzenhorn (April 10, 2012). "Moscow Protesters Try to Expand Movement". The New York Times. Retrieved April 11, 2012. ^ David M. Herszenhorn (April 12, 2012). "Opposition Finds Apathy Over Election in Russia City By DAVID M. HERSZENHORN". The New York Times. Retrieved April 13, 2012. ^ David M. Herszenhorn (April 14, 2012). "Moscow Protesters Take Their Show on the Road". The New York Times. Retrieved April 15, 2012. ^ "Итоги::Астраханьстат". Retrieved July 22, 2018. ^ Jean Demangeot (February 13, 2001). Les milieux désertiques. Armand Colin. p. 9. ISBN 978-2-200-28492-3. ^ "Pogoda.ru.net (Weather and Climate-The Climate of Astrakhan)" (in Russian). Weather and Climate. Retrieved May 13, 2015. ^ "Astrahan (Astrakhan) Climate Normals 1961–1990". National Oceanic and Atmospheric Administration. Retrieved May 13, 2015. ^ "Heydar Aliyev Foundation - Azerbaijan-Russia Friendship Bridge in Astrakhan". heydar-aliyev-foundation.org. Retrieved September 6, 2017. ^ "Azerbaijan, Russian Astrakhan mull relations". azernews.az. Retrieved September 6, 2017. ^ APA Information Agency, APA Holding. "APA - Presidents of Azerbaijan and Russia met in Astrakhan - PHOTO". en.apa.az. Retrieved September 6, 2017. ^ "News.Az - Azerbaijani first lady Mehriban Aliyeva receives Astrakhan Oblast Order of Merit". news.az. Retrieved September 6, 2017. ^ "tass.ru/en/world/699466". tass.ru. Retrieved September 6, 2017. ^ "Гейдар Алиев на полях сражений Ивана Грозного - астраханские записки Эйнуллы Фатуллаева". Haqqin. Retrieved September 6, 2017. ^ "رشت و آستارا خان خواهر خوانده شدند+ تصاویر | پایگاه خبری تحلیلی 8دی نیوز". 8deynews.com. Retrieved September 6, 2017. Государственная Дума Астраханской области. Закон №67/2006-ОЗ от 4 октября 2006 г. «Об административно-территориальном устройстве Астраханской области», в ред. Закона №46/2017-ОЗ от 5 сентября 2017 г. «О преобразовании муниципальных образований и административно-территориальных единиц "Лебяжинский сельсовет", "Образцово-Травинский сельсовет", "Полдневский сельсовет" и внесении изменений в Закон Астраханской области "Об установлении границ муниципальных образований и наделении их статусом сельского, городского поселения, городского округа, муниципального района" и Закон Астраханской области "Об административно-территориальном устройстве Астраханской области"». Вступил в силу по истечении 10 дней со дня официального опубликования. Опубликован: "Сборник законов и нормативных правовых актов Астраханской области", №47, 19 октября 2006 г. (State Duma of Astrakhan Oblast. Law #67/2006-OZ of October 4, 2006 On the Administrative-Territorial Structure of Astrakhan Oblast, as amended by the Law #46/2017-OZ of September 5, 2017 On the Transformation of the Municipal Formations and the Administrative-Territorial Units of "Lebyazhinsky Selsoviet", "Obraztsovo-Travinsky Selsoviet", "Poldnevsky Selsoviet", and Amending the Law of Astrakhan Oblast "On Establishing the Borders of the Municipal Formations and on Granting Them the Status of Rural, Urban Settlement, Urban Okrug, Municipal District" and the Law of Astrakhan Oblast "On the Administrative-Territorial Structure of Astrakhan Oblast". Effective as of after ten days from the day of the official publication have passed.). Государственная Дума Астраханской области. Закон №43/2004-ОЗ от 6 августа 2004 г. «Об установлении границ муниципальных образований и наделении их статусом сельского, городского поселения, городского округа, муниципального района», в ред. Закона №47/2017-ОЗ от 5 сентября 2017 г. «О внесении изменений в Закон Астраханской области "Об установлении границ муниципальных образований и наделении их статусом сельского, городского поселения, городского округа, муниципального района"». Вступил в силу через 10 дней со дня официального опубликования. Опубликован: "Астраханские известия", №34, 12 августа 2004 г. (State Duma of Astrakhan Oblast. Law #43/2004-OZ of August 6, 2004 On Establishing the Borders of the Municipal Formations and on Granting Them the Status of Rural, Urban Settlement, Urban Okrug, Municipal District, as amended by the Law #47/2017-OZ of September 5, 2017 On Amending the Law of Astrakhan Oblast "On Establishing the Borders of the Municipal Formations and on Granting Them the Status of Rural, Urban Settlement, Urban Okrug, Municipal District". Effective as of the day which is 10 days after the official publication.). Городская Дума муниципального образования "Город Астрахань". Решение №24 от 31 марта 2016 г. «Устав муниципального образования "Город Астрахань"», в ред. Решения №91 от 17 июля 2017 г. «О внесении изменений в Устав муниципального образования "Город Астрахань"». Вступил в силу 22 апреля 2016 г. (за исключением отдельных положений). Опубликован: "Астраханский вестник", №15, 21 апреля 2016 г. (City Duma of the Municipal Formation of the "City of Astrakhan". Decision #24 of March 31, 2016 Charter of the Municipal Formation of the "City of Astrakhan", as amended by the Decision #91 of July 17, 2017 On Amending the Charter of the Municipal Formation of the "City of Astrakhan". Effective as of April 22, 2016 (with the exception of certain clauses).). Государственная Дума Астраханской области. №21/2007-ОЗ 9 апреля 2007 г. «Устав Астраханской области», в ред. Закона №49/2017-ОЗ от 25 сентября 2017 г. «О внесении изменения в статью 17 Устава Астраханской области». Вступил в силу 30 апреля 2007 г. (за исключением отдельных положений). Опубликован: "Сборник законов и нормативных правовых актов Астраханской области", №18, 19 апреля 2007 г. (State Duma of Astrakhan Oblast. #21/2007-OZ April 9, 2007 Charter of Astrakhan Oblast, as amended by the Law #49/2017-OZ of September 25, 2017 On Amending Article 17 of the Charter of Astrakhan Oblast. Effective as of April 30, 2007 (with the exception of several clauses).). Городской Совет города Астрахани. Решение №123 от 1 ноября 2000 г. «Об утверждени гимна города Астрахани». (City Council of the City of Astrakhan. Decision #123 of November 1, 2000 On Adopting the Anthem of the City of Astrakhan. ).